The impireal family of austria - the hapsburgs - were known to have a "Habsburg lip" but any other known traits of the hapsburgs? Does someone have a picture of the Hapsburg lip? The "Habsburg Lip" or more correctly "Habsburg Jaw" is a medical condition known as Prognathism. refer Wiki for full explanantion. Still have a hard time with the idea that inbreeding can cause a humongous jawline/chin. I was interested in studying more about the line that would supposedly claim the throne of Spain from the Habsburg line. As most of you probably know, in 1700, Charles II of Spain, a member of the House of Habsburg, died with no heir and that event triggered the War of Spanish Succession, which ultimately led to a victory of the French Bourbons and the throne being taken by the Duke of Anjou, later known as Philip V of Spain. However, I find that claim to be relatively weak regarding the fact that the relation Philip V had to Philip IV was through his grandmother, Maria Theresa of Spain, and considering that comes from a female line, it would be more likely that the throne pass on to a brother of Philip IV, as there was none available, then to his father Philip III's brother, if none available, then keep on digging until one is found. However, I managed to track lines, which even lack some good info, so I can't be sure, up to Charles V, Holy Roman Emperor. But even if the Bourbons seized the throne by force of arms, the law is the law and we should look back and see if there wouldn't be a more appropriate claimant to the throne. Now here is my question, considering that Charles V was Archduke of Austria, and the line continued there until Blessed Charles I of Austria-Hungary, and now His Imperial and Royal Highness Karl von Habsburg, who would be the most fitting claimant to the Spanish throne? Karl von Habsburg? Or there would be another person more related to Philip IV (or even Charles II for that matter, however his line died there and that is the whole cause of this mess). The whole Habsburg claim was fought out in the War on the Spanish succession and has been 'settled' with the Treaty of Utrecht in 1713. In 1700 Don Carlos de Habsburgo y Borbón, King of Spain, of Naples, of Sicily, of Sardinia, Duke of Luxembourg and Lord of the Netherlands died. His two marriages with Marie-Louise d'Orléans and Maria-Anna von Bayern were without issue. The strongest claim on the throne of Spain had Don Carlos II's nephew Louis de Bourbon (1661-1711), Dauphin de France, son of Louis XIV de Bourbon, King of France and of María Teresia de Habsburgo y Borbón (sister of Don Carlos II). Because Louis ("le Grand Dauphin"), and his eldest son Louis ("le Petit Dauphin") had to remain available for the succession to the throne of France, he transferred his rights to his second eldest son Philippe de Bourbon, Duc d'Anjou. Don Carlos II of Habsburg, King of Spain died in 1700. No issue. Note that the succession in Spain was semi-salic: sons had preference over daughters in the same degree of consanguity, which means that the succession could be transferred to females by lack of male heirs. If the Spanish succession followed Salic law (which, as Duc has pointed out, it didn't), then they would have had to have gone back some ways for a male-line relative. 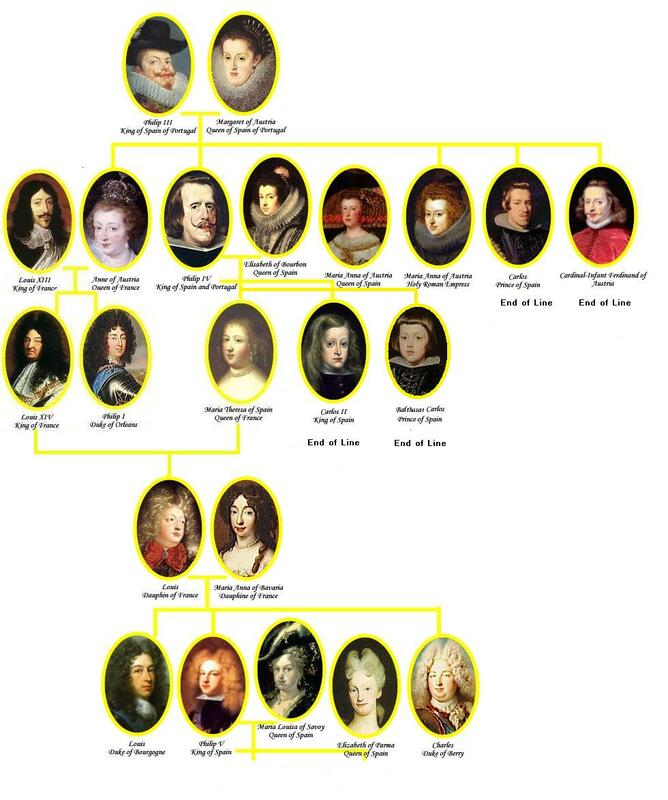 Leopold I doesn't actually have any male-line descendants alive today, his sons' sons both having died in infancy. I'm not entirely sure if there are any Habsburg male-line descendants still alive today - the Habsburgs themselves in Austria aren't actually male-line descendants, and just a quick look through the peerage.com is making me think there aren't any. Karl von Habsburg is not a male-line descendant of the Habsburgs as they existed at the time of the Spanish War of succession; his male-line ancestor, Francis I, was a female-line descendant of the Habsburgs, who married a Habsburg, Maria Theresa, uniting the House of Lorraine (Francis) and the House of Habsburg (Maria Theresa) and making him Holy Roman Emperor. But, if salic law was in play either Spain or the Holy Roman Empire at the time Francis and his descendants - including Karl von Habsburg - would have had no claim to either throne. I wonder if anyone here has any known Habsburg ancestry. If so, who was your most recent ancestor? I do, but it is extremely distant. I'm pretty certain that the heavy inbreeding hadn't took place at that time. Margarete von Österreich (Habsburg) 1416-1486, sister of Frederick III, Holy Roman Emperor.